Keep Your Faucet Looking and Working Great! When it comes to the faucets in your home or commercial building, they need to be working at all times. When a faucet stops working, it can be from a number of things. Something you can do to avoid any problems is to make sure that your faucet is cleaned regularly. If you have a room that is not used often, make sure that you are at least tuning the faucet on in there from time to time as well. A faucet repair is usually something simple like tightening a pipe or making sure that it is connected all the way. If you have an older faucet, it might be time to replace the one that you have and upgrade it to something that will work more efficiently. There are many options of faucets out there that will meet the needs that you are looking for. When you need a faucet repair in Mills River, Hendersonville, and Asheville, NC, you will need to make sure that you call All About Plumbing & Septic at 828-778-2425. We are always available to do a faucet repair. These are usually pretty quick jobs so sometimes we can swing by at a moments notice and get it looked at. Our plumbers are dedicated to making sure that your needs are met and that you have everything you need to keep your home and business running like it should be. We will always let you know if a faucet repair cannot be done and that it would be better off to do a replacement. We carry a good variety of faucet options as well that could work for you, but at the end of the day, we want you to be satisfied with whatever you are getting. Give us a call, and we will be able to answer any of the questions that you might have. Corrosion – Over a period of time, corrosion can build up inside or around your faucet. This not only makes your faucet appear to be dirty, but it can also affect the quality of the water that is coming out of the tap. If you have been noticing that your water tastes different, it could be that rust has developed inside of the faucet itself. Sometimes this can be cleaned out and the faucet will be fine, but in other situations, the rust or corrosion will have eaten away at the faucet. If this happens, you are much better off with a replacement that will allow you to start over new. Leaking – A leaking faucet is something that most homeowners have experienced before. Sometimes it is as simple as tightening up the faucet and stopping the leak. If one of the o-rings around the faucet become worn or damaged, it can cause a leak to start happening. This is actually a very common occurrence, and we will always check this first because it tends to be something very commonly seen. A faucet repair can be needed when there is a leak coming from the faucet itself, underneath your sink, or even at the base. Contact Us for Fast Faucet Repairs in Your Home! Poor Install – Installing a faucet is not as easy as it looks. If you have never installed a faucet before, you can very easily skip steps on accident and end up needing a faucet repair down the line. If you do the installation yourself, make sure that you are reading the directions and taking the process slowly. If you decide that you want to have someone install it for you, our expert plumbers can have it done quickly. This way you will not have to worry about any issues down the line and an expert will be checking it out before they leave. A few signs of a poor installation job would be that the faucet seems to not be fully sealed down of secured It might also have a slight drip coming from the top or the water pressure may not be very strong from the beginning. Low Water Pressure – When a faucet suddenly starts to give you lower water pressure, it means that something has gone wrong somewhere. If the rest of the water pressure in your home or commercial building is fine, then you can pinpoint that it is a problem specifically with your faucet and you will need a faucet repair done. Choosing a professional to install your faucet and take care of a faucet repair that you might have is a good idea. This will help you avoid any issues down the line and also the headache that comes along with doing an installation on your own. Our professional plumbers at All About Plumbing & Septic are here to help you with anything you need and are also available 24 hours a day in case you need an emergency plumber. 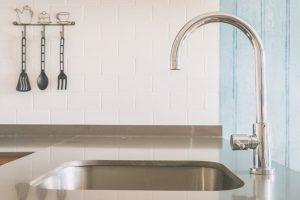 When you need a good quality faucet repair in Mills River, Hendersonville, and Asheville, NC, that you can depend on, call us at 828-778-2425, and we will always be there to help you. Updated on January 22, 2019 at 12:45 pm by All About Plumbing.